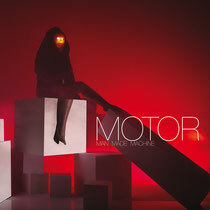 MOTOR are about to release another album, which opens a new chapter in the history of the band. After completing three massively successful and critically acclaimed techno albums, Bryan Black and Oly Grasset, who together form the duo MOTOR, have shifted gears and recorded a song-based vocal album by the name of ‘Man Made Machine’. The album was conceived during their world tour with Depeche Mode in 2009 when Dave Gahan fell ill and the band found themselves in a hotel in Berlin with time on their hands. It features the vocalists Martin L. Gore (Depeche Mode), Gary Numan, Billie Ray Martin (S'Express, Electribe 101) and Motown's rising new star Reni Lane. Just recently, when MOTOR secretly played the first single from the upcoming album (also titled ‘Man Made Machine’) on a BBC radio broadcast, it got over 10,000 views within hours of being ripped and broadcasted on Youtube. The reactions from Depeche Mode and MOTOR fans were absolutely ecstatic. Sometimes music critics are still having difficult times grasping or quantifying just exactly how significant MOTOR´s contribution to modern music actually was and is, but there is hope that the upcoming album will add to a deeper understanding of the importance of this unique act. The album features some of the key figures in the evolution of electronic music as the duo have played as the main support act on sold out tours for Gary Numan, Nitzer Ebb and Depeche Mode and have been considered one of their best received support acts. They have performed on the main stages of all the top festivals with acts like Daft Punk, Kraftwerk, Soulwax, Justice, etc and are known for having one of the most explosive and entertaining live shows in dance music. As well as been used with fashion labels and shows, MOTOR’s music has been featured on various HBO and Showtime TV programs, in films and in several Playstation and Nintendo video games. Their impressive list of remixes includes ‘Precious’ by Depeche Mode and in Mixmag 2006, Depeche Mode actually listed this one as their favourite DM remix of all time. The long-player is going to be released on a new sub-division of Chris Liebing´s CLR (Create Learn Realize) label, one of the leading German techno imprints. The branch is called CLRX and is out to explore new sonic universes of a musically more complex, song-structured nature. The founding of CLRX shall help people to distinguish easily between the classic CLR sound and the slightly different one of this new venture. The single ‘Man Made Machine’ featuring Martin L. Gore and remixes from Radio Slave, Chris Liebing and Black Asteroid is released 30 March. Check it below.